Kris Kris, the brand that has been associated with innovation and differentiation in bread, is officially introducing to consumers its new philosophy and brand identity, “We Knead what is of value”. Changing everything we know about packaged bread, Kris Kris commits to enriching our daily lives with genuine, nutritious and delicious bread, made with authentic, top-quality ingredients. “Fetes Zois” sliced bread with no added sugar and all the nutritional value of extra-virgin olive oil and wheat germ. The “We knead what is of value” philosophy is based on the conviction that life is unpredictable and full of moments, which we should be living and appreciating, seeking enriched and meaningful “ingredients” to fill it with. Adhering to these principles, Kris Kris has already been a pioneer, for the past 50 years, in the production of bread and dough products that meet the consumers’ evolving, daily needs. It introduced the 1st packaged sliced bread in Greece (1967) and was also 1st one to begin the production of preservative-free bread (1992), using pasteurization. 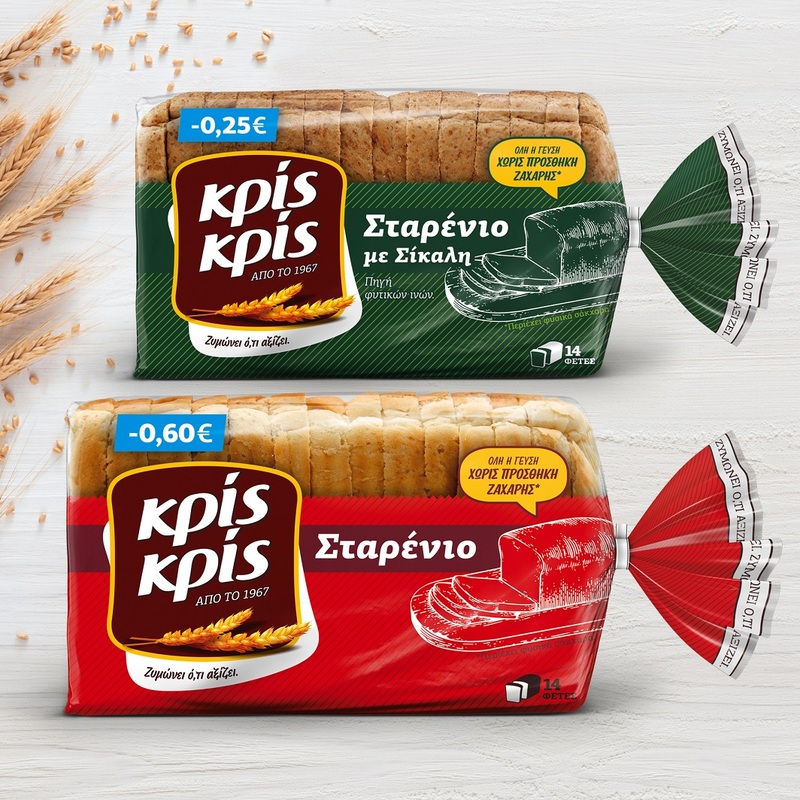 Since then, Kris Kris has been continuously innovating, developing “Fetes Zois”, the 1st bread of high nutritional value (2005) and the “Tostimo!” product family (2009), which elevated the flavour of sliced bread to the highest level. Today, inspired by the “We knead what is of value”, philosophy the growing Kris Kris product family is entering a new era, with new packaging and a wide variety of delicious options. Kris Kris “Sliced Bread”, which has been for years a popular classic, is now made ?? baked without added sugar, using however a modern method of bread-making that highlights the flavour of our favourite bread. Now everyone can enjoy the full flavour of their daily bread, without the effects of extra sugar. Kris Kris sliced bread is available in two delicious flavours: wheat and rye. Kris Kris “Fetes Zois” has been enriched with the nutritional value of extra-virgin olive oil and wheat germ, the most nutritious part of the wheat kernel – both ingredients holding a dominant place in the Mediterranean diet – and with no added sugar. Now all those pursuing a balanced diet, can enjoy “Fetes Zois” in the classic wheat and 100% whole wheat versions, and also the brand new multi-grain and pumpkin seed flavours. Also, for the fanatics of great taste, the Kris Kris “Tostimo!” product family is now available in new packaging and in a variety of flavours and types, so delicious that can be eaten on its own. Kris Kris’ new philosophy, “Kneading value”, is being presented to consumers through an integrated communications campaign, covering news media, online outlets and social platforms, as well as points of sale with special presentations, tastings and promotional activities. On Thursday 14 February, the “Kneading value” philosophy was presented to partners, mass media representatives, food experts and food bloggers at a special event, featuring chef Dimitris Skarmoutsos and nutritionist Lampros Melistas. The two distinguished guests, through an impressive interactive presentation, guided the audience through a journey into the past, present and future of bread, following the evolving dietary trends, consumer needs and preferences and the continuous innovation in bread-making. Increased consumption of sugar has been linked to a greater risk of obesity, cardiovascular disease, type 2 diabetes and tooth decay. Greece currently ranks No 1 in childhood obesity in Europe. Recognising the risks of excessive sugar consumption, the World Health Organisation recommends that adults and children decrease their daily intake to less than 10%, and even down to 5%, of their total calorie intake. The WHO recommended amount of sugar is equal to 6 teaspoons a day. This quantity includes not only the sugar that we add to our food, but also sugar that is hidden in packaged foods, such as bread. Greece is amongst the countries with the highest sugar content in packaged bread in Europe. About 95% of packaged bread currently on the market contains added sugar. It is estimated that, on average, 2 slices of packaged wheat bread contain about 1 spoonful of hidden added sugar. Greek consumers eat 2,100 tons of sugar annually through packaged bread. Bread’s basic ingredients are flour, water, salt and sourdough starter or yeast. Other ingredients, such as grain kernels, bran, non-wheat flours, oil, etc., can be added, depending on the type and variety of bread. Sugar, however, is not necessary and is not used in traditional bread-making, except for sweet bread recipes that are not, however, intended for daily consumption. It is unique and irreplaceable, the cornerstone of a healthy diet, of an authentic Mediterranean flavour and of Greek tradition. Hippocrates, the father of medicine, was the first to recognise the benefits of olive oil, calling it a “mighty remedy”. It is rich in components that are invaluable to protecting health and ensuring wellness and longevity, such as monounsaturated fatty acids, mainly oleic acid and polyphenols (which are important antioxidants for the body). The benefits of olive oil are not limited to preventing cardiovascular disease, but also help protect the body against the risks of developing cancer, osteoporosis, hypertension and other diseases.